Save the Harbor/Save the Bay released its annual water quality report card on the Boston Harbor region’s public beaches from Nahant to Nantasket on Friday, May 27, 2016 just in time for Memorial Day. This year’s report includes a comparative analysis of five years of water quality data for 15 beaches in nine communities that include Nahant, Lynn, Revere, Winthrop, East Boston, South Boston, Dorchester, Quincy and Hull. In 2015, overall water quality on all of the Boston Harbor Region’s public beaches was down from a high of 96% in 2014 to 92% in 2015, primarily as a result of frequent summer storms. Though total rainfall was actually up slightly from 2014, in 2015 there were more than 30 summer days with some rain, which adversely affected water quality on beaches in Lynn, Revere, East Boston, Dorchester and Quincy. 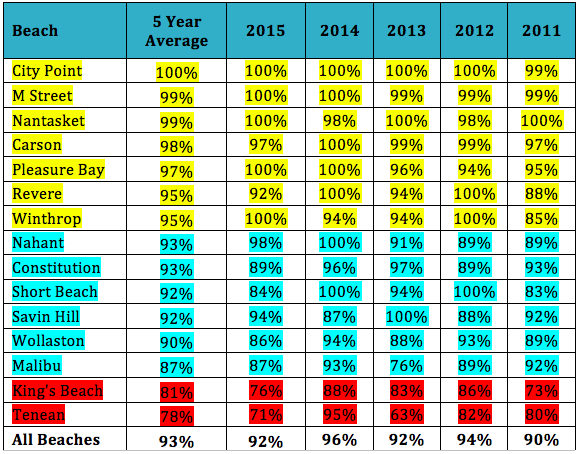 City Point, M Street, and Pleasure Bay in South Boston and Nantasket Beach and Winthrop Beach topped the list this year, with perfect scores of 100%. Of the 15 beaches in the report, which was based on data collected during the 2015 swimming season, 7 earned primary beach safety scores of 95% or more while 6 scored 85% or higher. 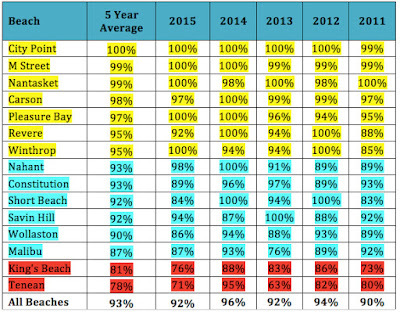 King’s Beach in Lynn and Swampscott scored just 75% and Tenean Beach in Dorchester scored just 71%, failing to meet the state swimming standard more than once every 5 days during the 2015 swimming season. Funds to improve water quality in beachfront communities and waterfront neighborhoods from Nahant to Nantasket were authorized in the 2014 Environmental Bond Bill but have not yet been appropriated. “The Baker-Polito Administration remains committed to ensuring the state’s beaches remain not only accessible for all to use, but also safe for public enjoyment,” said Energy and Environmental Affairs Secretary Matthew Beaton. “The Water Quality Report Card serves as a good barometer of the excellent results the state and its partners are achieving to ensure the Commonwealth’s beaches remain among the cleanest and most beautiful in the nation, and we remain committed to work with Save the Harbor/Save the Bay and other stakeholders to protect and improve these spectacular natural resources for generations to come." 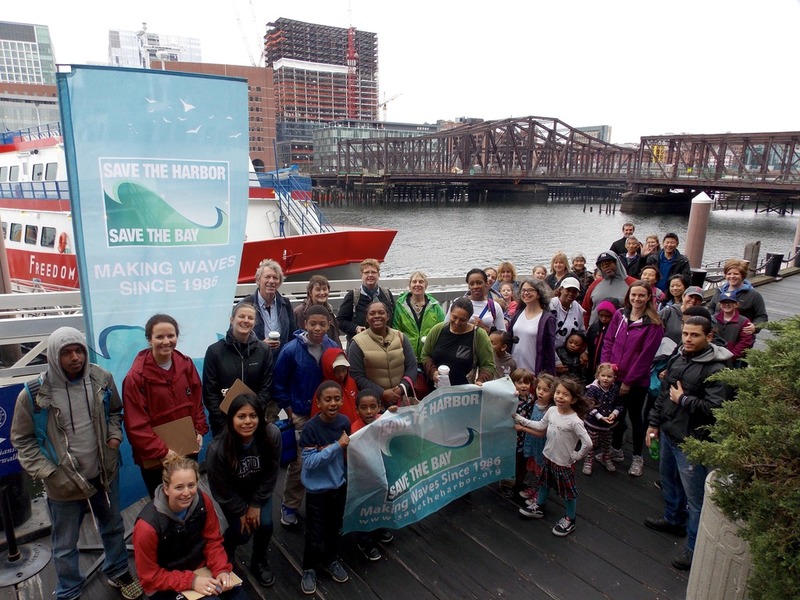 Save the Harbor/Save the Bay would like to thank Dr. Jim Shine and Dr. Judy Pederson, Co- Chairs of our Beaches Science Advisory Committee, Kelly Coughlin and David Wu of the MWRA, DCR’s Dennis Fitzgerald and Save the Harbor policy interns Eileen Dalessandro, and Brittany Angelo for their help with this report. Excited about trail work in Denali National Park. management, as well as a number of re-vegetation and demolition projects. I was also very lucky to work in multiple different locations throughout Alaska, one of them being Denali National Park and Preserve. Since returning home from Alaska last September, I have had the privilege of volunteering with the Marine Mammal department at the New England Aquarium. When I am there, my day consists of preparing food for the animals, cleaning exhibits and toys, enriching (or “play time” with) the seals with toys we created, and also interacting with aquarium guests. When I am not at the aquarium spending time with seals and sea lions, I am with dogs at the dog daycare I work for. Needless to say I love animals! 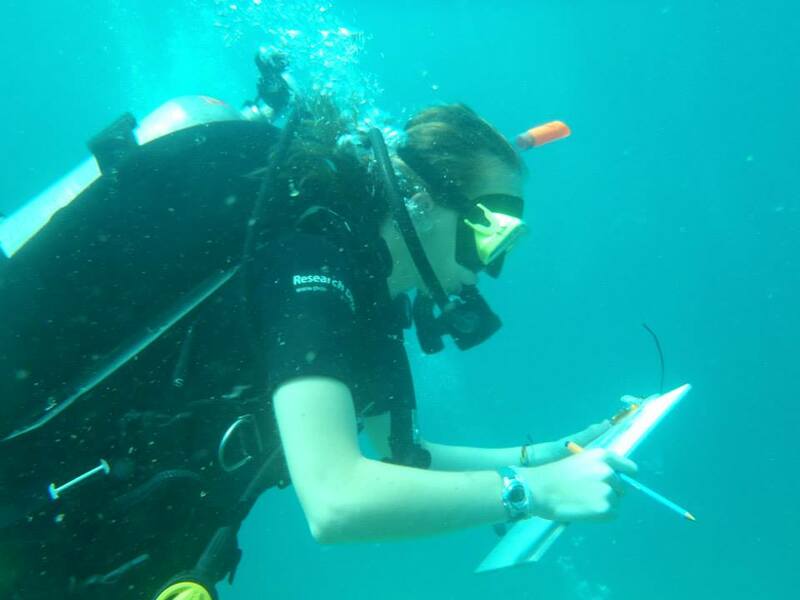 I would like to ultimately be working with marine mammals whether directly as part of a rescue team or behind the scenes, fighting for them as a policy maker. I took this internship at Save the Harbor/Save the Bay to learn about working with a non-profit organization and also more about policy work. I am looking forward to the time that I spend with Save the Harbor/Save the Bay and know that it will be an amazing, educational experience. 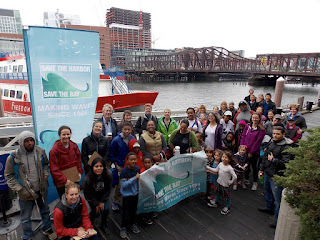 Hi, my name is Isabella and I can’t wait to tell you about how my days were back with Save the Harbor save the bay. It feels so good to be back with Save the Harbor! 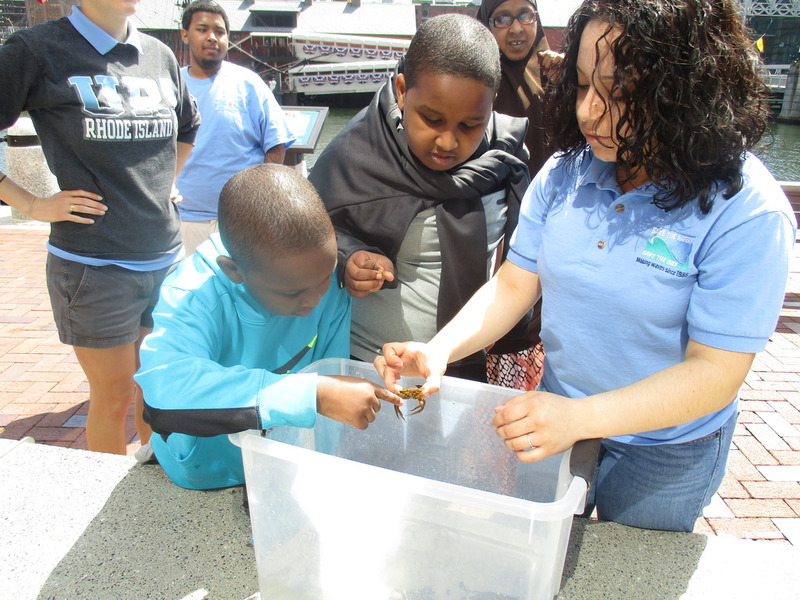 I missed interacting with kids and teaching them about the animals that come from the harbor. To be honest it took a while to remember everything about the crabs and other animals we had with us but, not too worry as soon as I picked up a crab i remembered everything i had ever learn with SHSB. It feels great to interact with kids who are interested and care for these animals just like we do everyday. Whether it's cleaning up the beach to making sure our water to clean and or traveling to our morning meetings. I can't wait to come back in about 2-3 months to explore even more than before! 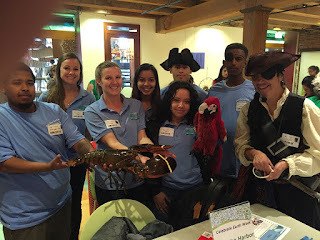 This week I had the pleasure of working at the Children's Museum's Earth Day. 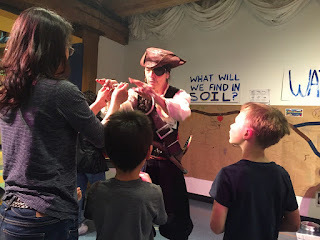 We heard pirate stories and even solved some riddles. Larry the lobster joined us, and all of the kids loved him. My favorite part of the day by far was the mural. 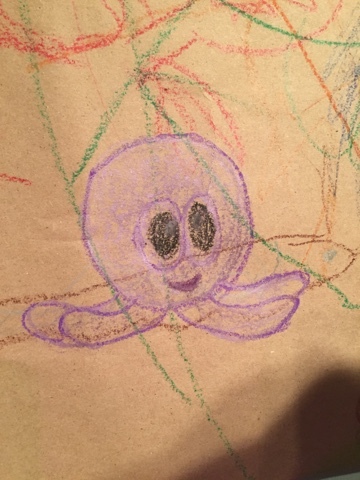 I had a drawing competition with a friend and of course my octopus won. The mural was full of fun aquatic life and some interesting characters such as Dori and Sonic were drawn. 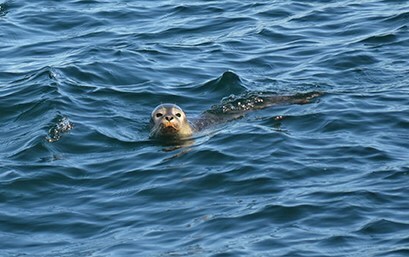 Later in the week we went on the Marine Mammals Safari, where we saw seals more than 10 times. They were hard to spot but all of the kids had their eyes peeled. I met one family who was there photographing each sighting, but when seals weren't there they were excited about every animal they saw. They photographed birds and even buildings. It was great to see a family from right in Boston enjoy seeing the nature around them. They were truly inspiring because they showed me that just because things aren't going as planned that doesn't mean it's not still great. 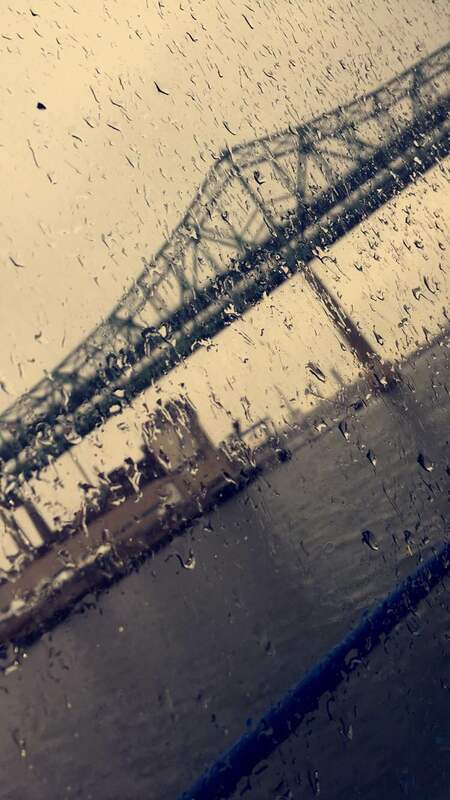 My experience coming back together with Save the Harbor Save the Bay was very great, getting to meet the newer staff and being able to bond again with the crew. Even though it's been 2 years it felt like I never left, they welcomed me. 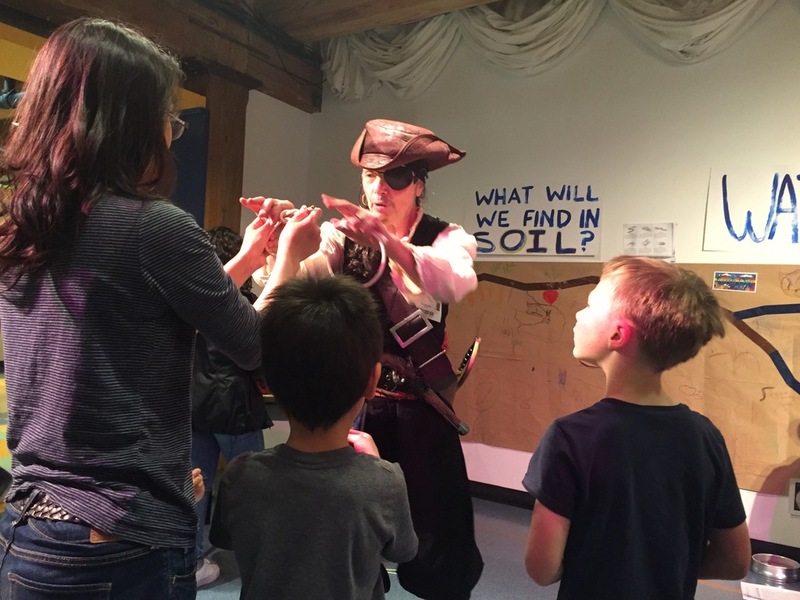 The activities at the Children Museum were exciting because i got to meet Larry the lobster & a crew of pirates. It was fun hearing stories & showing the lobster to all the kids inside the museum. I enjoyed being able to see & touch the touch tank they had placed for the children, saw many sea animals like cray fish, sea star, snails, crabs, water roach. 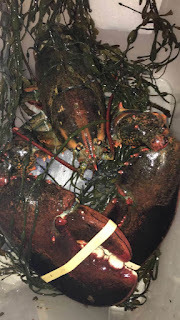 The next day across from the museum in the grass field at Atlantic Wharf I got to interact with some of the kids & talk about the harbor animals & the new Larry the lobster they had. The final day on the boat I had a blast that I was able to see a seal & a couple of black birds flying & basking around. 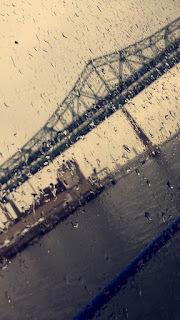 The boat ride around the harbor was smooth, I got to take a couple pictures & meet new people & families, this whole experience showing me how important is team work & interacting with the children making their smiles on their faces.